Drift away to Paradise as you feel the stress and tension melt away from your aching muscles through the massaging action of 131 jets! 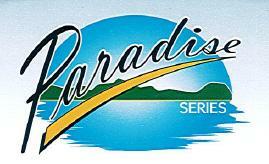 Paradise Series spas boast the finest hydrotherapy seats and luxury options QCA Spas has to offer. Choose from 5 different models that accommodate up to 8 people, with 70 to 131 jets.